The Melissa Dream tablets are innovative tablets combining lemon balm, camomile, vitamins and minerals in a formulation which does not cause drowsiness, but nourishes the body to relaxation and tranquility. 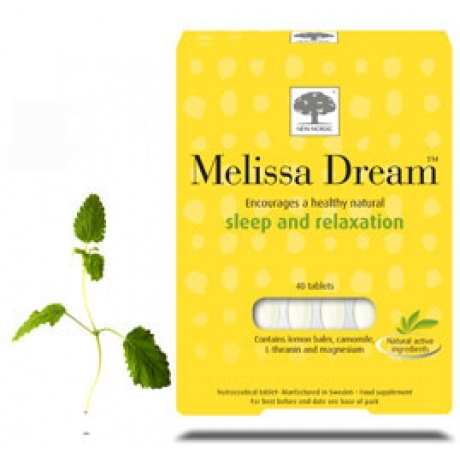 Melissa Dream tablets include lemon balm, which helps maintain a healthy and calm sleep and relaxation plus B vitamins which help maintain a normal function of the nervous system. The tablets' content of magnesium helps normal muscle contraction all night. For Sleep disorders: Take 2 to 3 tablets before bedtime. After two weeks use, 2 tablets is sufficient. For Stress relief: Take 1 tablet during the day, as needed. Is Melissa safe to take? Melissa is generally very safe to take. However, if you are taking sedatives (for sleep disorders or anxiety) or medications to regulate your thyroid, you should consult a health care provider before taking Melissa. Since Chamomile may make asthma worse, people with asthma should not take Melissa. If you are pregnant, breast- feeding or taking any prescribed medication consult you GP or pharmacist. Children under 12 years should only take this product after consultation with a GP. Keep out the reach of children. Food supplements should not replace a varied diet and healthy lifestyle. Works synergistically with Camomile to promote sound sleep. Creates a sense of relaxation within 30-40 minutes. Stimulates the production of GABA, leading to more serotonin and dopamine, both key relaxation agents. Well known from the use in teas. Important for relaxing muscles and nerves. Affects neurotransmitters in the brain, to relieve stress, anxiety and depression. Lack of B-vitamins contribute to mood and sleep disturbances. Melissa is a natural product that was designed to reduce stress and induce sound sleep, making you wake up refreshed and rested. It is made from Lemon Balm, Chamomile, L-theanine, Magnesium and selected B-vitamins. What are the main active ingredients in Melissa? Lemon balm is considered a "calming" herb. It was used in the Middle Ages to reduce stress and anxiety, promote sleep, and ease discomfort associated with digestion. Several studies have found that lemon balm combined with other calming herbs (such as chamomile) helps reduce anxiety and promote sleep. Chamomile has long been used, mostly in teas, as an effective calming agent. Studies indicate that low doses of chamomile relieve stress and anxiety, while higher doses promote sleep. L-theanine is an amino acid found in green tea leaves. Research on humans has demonstrated that L-theanine creates a sense of relaxation in approximately 30-40 minutes. The amino acid directly stimulates the production of alpha brain waves, creating a state of deep relaxation and mental alertness similar to what is achieved through meditation. Further, L-theanine is involved in the formation of GABA, which influences the levels of serotonin, producing the key relaxation effect. How are stress and sleep deprivation linked? There are many causes of sleep deprivation, but often daily stress is the major influencer. Problems of the day get amplified at night, making your mind overactive, keeping you from falling a sleep. The next day, after a poor night sleep, you feel tired and unable to focus, which again makes you stress more about the challenges of the day. It's a vicious circle. What are the consequences of stress and sleep deprivation? Stress is a debilitating condition that upsets the balance of our hormones leading to a loss of well-being, performance, and even lifespan. Stress impairs the immune system, leaving us vulnerable to infections, and can further cause depression. Sleep deprivation leads to a long line of problems. Heart problems, high blood pressure and even excess abdominal body fat occur as a result of sleep deprivation. Significant reductions in performance and alertness also occur. Reducing your night-time sleep by just 1.5 hours for just one night could result in a reduction of daytime alertness by as much as 32%. Mental problems such as mood disturbances, depression and anxiety also are linked to sleep deprivation. How does Melissa help Restless legs syndrome? Some sleep disorders are initiated by Restless Legs Syndrome. In most cases, there is no known cause for RLS, but we know that lifestyle changes, such as regular sleep habits, relaxation techniques and moderate exercise during the day can help. Further, Melissa contains magnesium, which relaxes the muscles and counteracts cramps and muscle irritations. How should I use Melissa? For enhancing sound and deep sleep, take 2-3 tablets one hour before bedtime. After two weeks, you may reduce to 2 tablets before bedtime. For reducing stress, take one Melissa tablet when needed during the day, such as one with every meal. This will give you a sense of calmness and relaxation, without making you drowsy. Chamomile may make asthma worse, people with asthma should not take Melissa.